The Fairey Battle light bomber was one of those pre-war aircraft that was a first. It was the first RAF monoplane light bomber. Designed to replace the Hawker Hart biplane, it was a quantum leap over that earlier design. However, like many aircraft of that period, it became obsolescent between its first flight in 1936 and squadron service a year later. Not a fault of the designers, just the way that aviation was progressing during those years. The real problem was new monoplane fighters. The Battle, as well as other monoplane bombers, was designed when most fighter opposition was from biplanes. It is always said that wars are fought with obsolete equipment, and that was true of the RAF as it was of most other air forces. 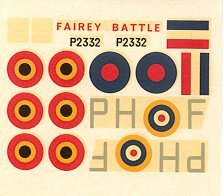 The Battle was one of the types sent to France in 1939 as part of the RAF's Advanced Air Striking Force. They performed well as long as they were protected from enemy fighters but did quite poorly on their own. As mentioned in the Airfix instructions, they are most remembered for their attack on the Maastricht Bridges in May 1940. Five Battles of 12 Sqadron, all manned by volunteers, attacked the bridges and were all shot down. That basically ended the Battle's operational career and it was used thereafter for various training duties. Ah yes, rivets. One really forgets how prevalent this feature was until one opens the box on an old Airfix kit. 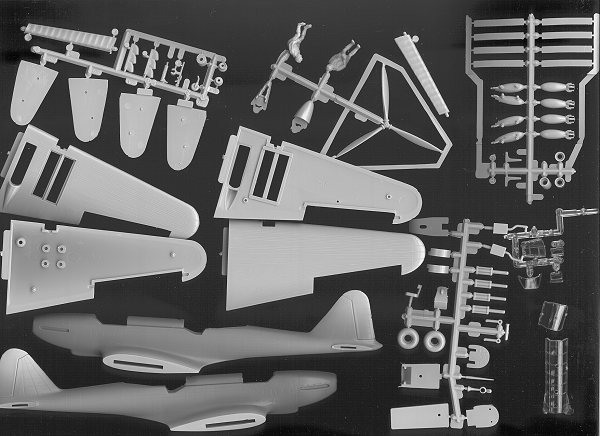 The kit is very complete and gives the option of positionable ailerons, gear up or down, and the option of having the wing bomb bays open or closed. It has a multi-piece canopy, but the thickness of the plastic seems to prevent one from having the cockpit open. The interior is at the standards of the day with a floor, seats, control stick, instrument panel, rear gun and crew members. There is also a full load of bombs for the bomb bays should you decide to display them open. I built this kit back 20 years or so ago when I was brush painting everything and filling seams wasn't heard of. I don't recall having any real problems with the kit other than messing up the canopy with glue! Over the years Airfix came under fire on this kit as they had apparently used preliminary drawings and got the nose or tail section wrong. Don't remember which it was, but surely a reader can help out. Don't think the problem is unfixable and the end result certainly looks like a Battle. The grey plastic parts are crisply molded and since this is probably the initial issue, there is no flash to be found. The instructions are most adequate with 8 construction and painting steps. Colors given are, of course, Humbrol, and consist of generic color callouts. The decal sheet consists of two subjects. One of them is one of the hapless 12 Squadron Battles from the Maastrich bridge debacle. The other is from the only country to buy the aircraft, Belgium. The decals themselves have yellowed in the 30 years this particular kit has been around, but are probably quite usable after a bit of sun bleaching and some decal film reapplication to prevent them from splintering when hitting the water as older deals tend to do. Overall a nice older kit that has never been done in this medium in 1/72. Only the recently has this aircraft been released in 1/48 by Classic Airframes as a short run multi-media kit. If you would like your product reviewed fairly and quickly by a site that has over 900 visits a day, please contact me or see other details in the Note to Contributors.